So I’ve come to realize that I can’t keep baked goods in the house–meaning, it’s better if I do not allow them through the door in the first place. This policy saves me some calories but leaves my husband and daughter feeling so deprived that they’re ready to pounce on anything containing flour and sugar like a pair of starving jackals. To appease them, I sometimes give in and bake something relatively healthy and small, and muffins fill the bill. 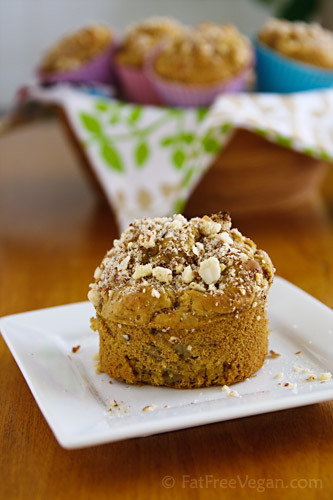 They’re lower in sugar than cupcakes and taste great made with whole grains, but perhaps most importantly, they’re easy to divide: one muffin is one muffin, whereas one slice of cake can mean anything from a sliver you can practically see through to a chunk the size of a toaster. In a family of muffin-hungry predators, it’s best to have something that I can divide quickly into equal portions and get my fingers out of harm’s way. With my family clamoring for muffins (it’s been a while) I finally broke down and made a batch. I found some of the most delicious organic white peaches at the local health food store and thought that their sweet perfumey taste would go well with the floral flavor of vanilla. So, to get a double-dose of vanilla, I scraped the seeds from one Bourbon vanilla bean and added some pure vanilla extract into the batter. The combination of rosy-peach and vanilla was just intoxicating. Since I am trying to cut down on sugar, I tried something new. A few weeks ago, a company called NuNaturals sent me several of their stevia products. Normally I don’t take products for review, but because I’m always trying new brands of stevia to see if I find something I like better than KAL, I decided to give NN a try. I’m happy to report that I liked NN’s Pure White Stevia Extract as much as KAL in my morning coffee and would buy it if it were less expensive. The product I was most interested in was their Stevia Baking Blend, a stevia-fiber formula that the package said could be used as a direct replacement for sugar. Since I’ve always found cooking with stevia to be tricky, I hoped that this product might end the guesswork of converting regular recipes to sugar-free. And it did–with one drawback. I found the fiber taste to be overpowering when used in a recipe that already included whole wheat flour. My family still scarfed the muffins down (E with a drizzle of agave nectar), but I thought the fiber taste took away from the peach-vanilla euphoria I was going for. I think that if you’re diabetic or unable to eat sugar for other reasons, this is a great product, but for myself, on those rare occasions that I bake, I will be using the real thing. Peel the peaches (if they are very ripe, the skin may easily peel off; if not, dip them in boiling water for 30 seconds and allow to cool before peeling) and remove the pit. Chop into 1/2-inch pieces. Mix with agave nectar (optional) and set aside. In a medium mixing bowl, mix the ground flax seed with the warm water. Slit the vanilla bean open and scrape the seeds from the middle with the back of a knife. Whisk the seeds into the flax mixture and save the vanilla bean for another use. (Try storing it in sugar to make vanilla sugar.) Add the vanilla extract, lemon juice, and soymilk to the flax mixture and whisk well to combine. In a large bowl, combine the flour, baking powder, baking soda, salt, and sugar or substitute. Mix well. Add the liquid ingredients and stir just until combined; batter will be thick. Fold in the peaches, making sure they are distributed throughout the batter. 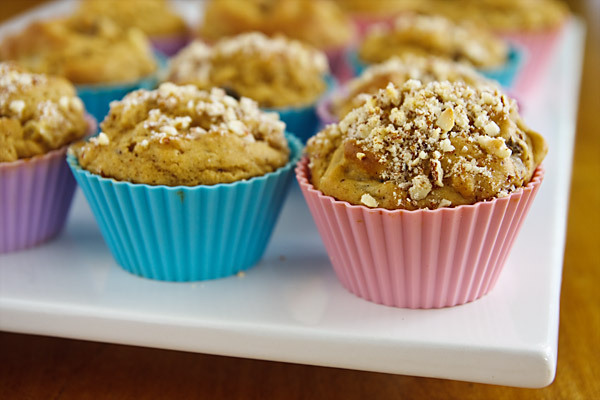 Fill each muffin cup to within 1/2-inch of the top. 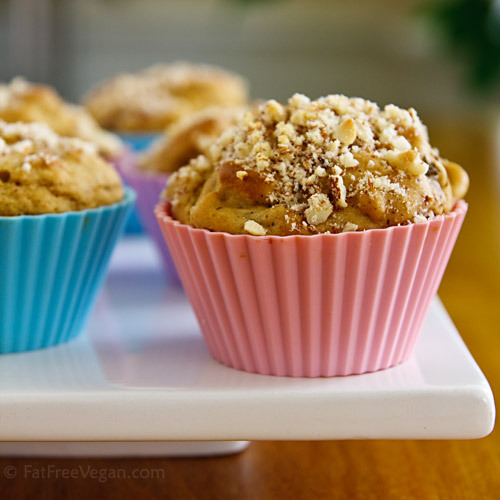 Smooth the top of each muffin and, if desired, sprinkle with chopped almonds. Bake until a toothpick comes out clean, about 15-20 minutes. Allow to cool before serving. Nutritional data below includes almonds but not sugar. With sugar, 95 calories, 19.5g carbohydrates, 2.6g fiber. I made these tonight and they look gorgeous. However, I can *really* taste the baking soda. It’s almost to the point of needing to throw the batch out. Have you ever run into this when baking these? I haven’t had that problem with this recipe. Are you sure that you used 1 teaspoon and that your baking soda didn’t have any lumps? Lumpy baking soda has caused my baked goods to have problems in the past. As usual, these were lovely. I used Stevia for the first time in my life for this recipe, so I had to experiment a little. I could only find the one that’s a hundred times sweeter than sugar, though, and since I also soaked the peaches in 1Tbsp. agave, I decided to add only 1tsp. and see how it turned out. As I said, they were really good: moist thanks to the peach chunks and sweet enough according to my parents and sister, who almost left me with no leftovers (I just made 12 muffins, instead of 16, and they were not too big). Thank you, Susan. Keep them coming! Susan, do you think these would work without any Stevia or sugar at all? Or maybe just a bit of agave syrup? I’m going to try these today but I’m diabetic so don’t want to use sugar, and I don’t like the sugar substitutes. If you leave out the sugar substitute, increase the flour by two tablespoons. You do know that agave nectar is sugar, though? Looks delicious.Sorry for asking a silly question but should the peaches be peeled before being chopped up? Not a silly question! Yes, I peeled the peaches first. See step 2. What causes the sodium count to be up there? Salt, baking soda, and baking powder, I think.